but most of all empowering. Starting the day of the Ferguson verdict, there have been three weeks of almost daily protests, sometimes with several different actions happening simultaneously. There have been several freeway takeovers, at times involving over 1,000 people. On the second day of protest, about 2,000 people marched through Temescal (rapidly gentrifying area of North Oakland), lit fires in the streets, looted corporate stores and smashed dozens of windows. 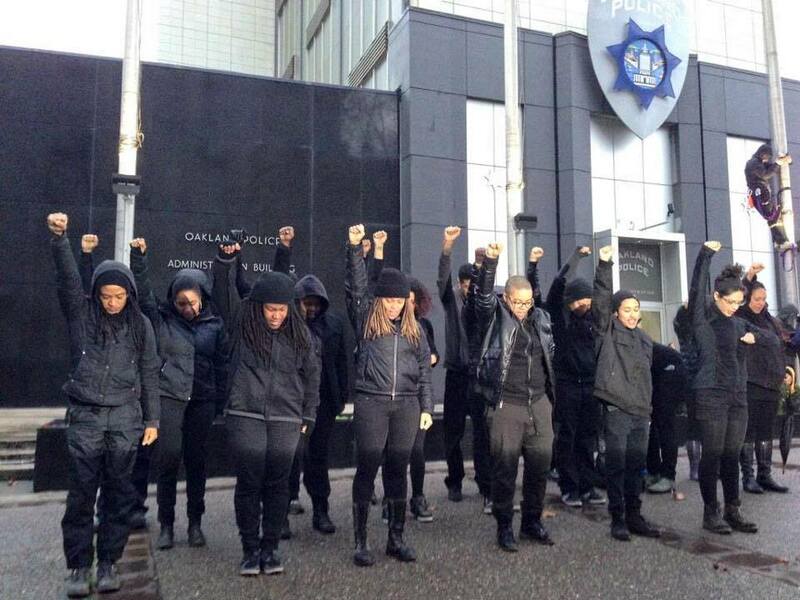 Fearing the inevitable public outcry if they acted with too heavy a hand, Oakland PD held back considerably. At the height of the rioting it looked like the cops were literally nowhere to be seen. When they did appear, their cars would be surrounded, had bottles and rocks thrown at them, and some were totally destroyed. Thanksgiving was the only day that people took off. 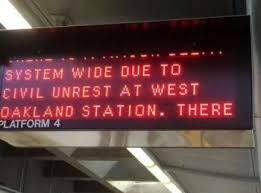 Black Friday saw the shutdown of West Oakland BART by the Blackout Collective. That evening a huge protest descended upon San Francisco, lots of stuff was smashed in Union Square and corporate stores and yuppie businesses in the Mission were also destroyed or looted. It seemed like things might die down, but then the Eric Garner decision came and re-ignited the anger. The protests re-focused to Berkeley and amazingly became more violent and more massive, with police releasing tear-gas and rubber bullets on a group of several thousand protesters, which only made people more willing to come out to the streets. Freeway takeovers grew in size. Amtrak trains were blocked. Despite the destructiveness and the police repression, every night seemed to get larger and larger. Downtown Berkeley was systematically wrecked, stores like Whole Foods were smashed and looted. In fact, looting (or “proletarian shopping”) seems to have increased over time. Local police forces from around the Bay have mobilized to assist OPD, CHP and Berkeley PD. On one night, we saw cops firing rubber bullets from an overpass into crowds below, injuring many (including hitting a person in the head). Security guards protecting news crews have pulled guns on people. CHP officers have gone undercover in the crowds, and one night ended up pulling a gun on people once they were outed. On First Fridays (a popular monthly street fair in Oakland’s Uptown neighborhood, which was mysteriously cancelled “due to weather”…even though it wasn’t raining) a march of perhaps 1,000 ended up storming the 880 freeway and then shut down the West Oakland BART station, before heading downtown and smashing up some banks and a new wine bar. Smaller protests (numbering between 300-500) continued nightly, regularly shutting down other BART stations in Fruitvale, Berkeley and elsewhere. The next weekend, the Millions March brought out over 5,000 people (probably the single largest action so far). The march was led by black folks with white people told to march at the back. After the main event, another march of maybe 600+ people took off, behind a blaring sound system and shut down the Alameda tunnel and then went back downtown, picking up tons of people until the crowd was maybe 1,000. Whole Foods was smashed up and fires set. Paint bombs and other objects were thrown at police. Several dozen people ended up being kettled and arrested that night. The next night, about 600 (mostly) white people showed up for a panel put on by the Catalyst Project with local black organizers. 300 people had to be turned away from that event! The next day, 250 people shut down OPD headquarters in downtown by locking to the doors and around the intersections and off-ramps near the building. We held the space for 4 hours and 28 minutes, the amount of time that Michael Brown laid in the street after being murdered. 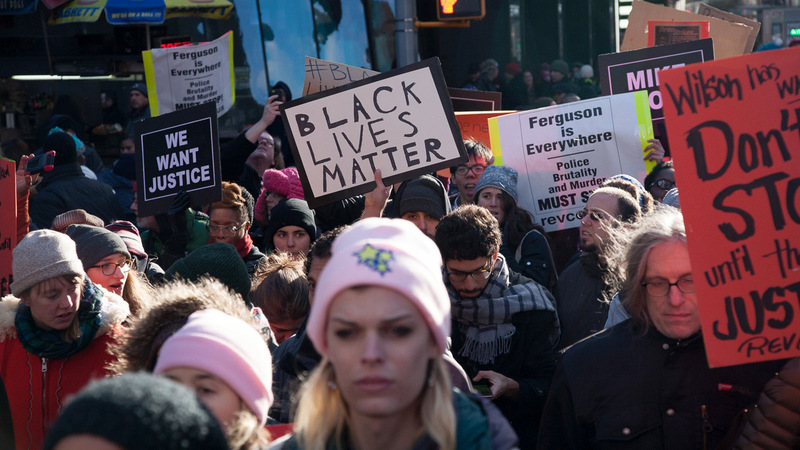 There have been smaller actions all throughout, including high-school walkouts, guerilla theater actions, and vigils to honor black lives, in addition to very well attended forums and political education events. Here’s a really good video that gives you some idea of what it looks like on the streets. Keep in mind, it’s been like this every night for three weeks. There are very important and urgent political discussions happening: the idea that white people need to step back is much more prevalent and accepted now, which is a huge victory. However, the riot-shaming has been pretty constant, even from the left. People have tried to write off the property destruction and looting as a “bunch of white anarchists.” As someone who has been out there most nights, I can say categorically that this is false. The folks in the streets, at least on the nights where most of the destruction and disruptive tactics took place were from all walks of life, and much more multi-racial than most activist spaces I’ve seen. There have certainly been white folks getting out of line and instigating property destruction when they probably shouldn’t have, but by the same token there have been even more white folks out here confronting black protesters for dragging garbage cans in the street, or physically protecting corporate store windows, or even tackling people of color engaging in property destruction or confrontations with the police. So it goes both ways. What I can say is that the largest actions, with the exception of the millions march, have also been the most militant and most disruptive, making me highly skeptical of any claims that the destruction has only been the work of a few people. The most incredible thing I’ve witnessed so far are the crews of black and brown youth, numbering probably 40 or 50, who float in and out of crowds and have been smashing and snatching stuff from stores, and then disappearing either back into the crowd or into alleyways, only to re-appear several blocks later. Trying to characterize the last few weeks of rebellion as the work of a bunch of white kids is not only inaccurate, it’s unhelpful, and it’s racist. People seem a lot more motivated to riot than hold peaceful, legal protests. There has been a huge push by groups such as the Catalyst Project to get white people to “step up their game.” While they have been hugely successful at getting white people to attend their actions and events, I personally feel their narrative is a little misplaced. From what I’ve seen, white people HAVE been showing up, in seriously huge numbers. At times those white people are acting poorly, but often they are showing courage, humility, and true solidarity. Sadly, a lot of the Catalyst Project folks have been totally absent at most the street demos and riots, which is where the majority of folks of color (and others) have been active. I would like to see more engagement with the white folks who are at these militant actions, because I think that’s where there is the largest potential for politicization and growing our imagination around what is possible (who would’ve thought we could literally shut down a major freeway like every night for two weeks?). Of course no one knows where this is all headed. The affect on people here is significant. The buzz of helicopters has been constant; most people have reported having a hard time sleeping on most nights. The sight of groups of police officers protecting every single freeway onramp/offramp is now a regular thing. Hundreds of windows continue to be boarded up. Signs of solidarity are coming from every direction. People have largely accepted militant protest…it doesn’t even seem controversial. 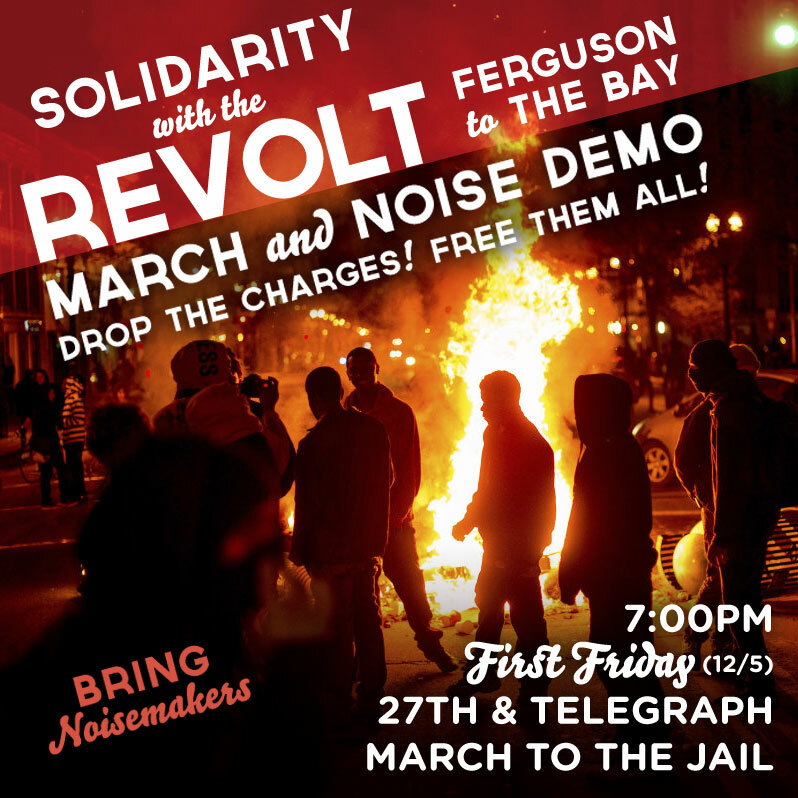 The mass-scale looting has made the freeway takeovers and OPD shutdown look tame by comparison. But things have been so constant, and I know it’s taken an emotional and physical toll on a lot of folks. Anxiety is running high. A lot of us have been sick, from sheer lack of sleep. It appears that things are stabilizing and being directed towards more organized forms of protest. 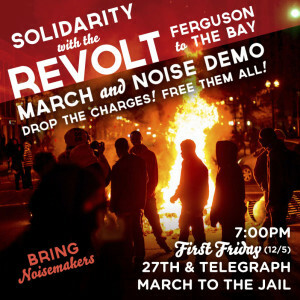 This seems inevitable, but I think it discourages some people, who have been inspired by the constant street protests. But the stated intention of groups like the Blackout Collective and others is to continue shutting things down until we get justice. It doesn’t feel like past movements (such as the Oscar Grant movement) where liberal nonprofits are successfully entering the scene and co-opting the energy. I think those groups have realized that people are too angry and disillusioned for that kind of co-optation (look at what happened to Al Sharpton…). So this re-direction of our efforts offers us some hope for more coordinated and strategic direct actions that will keep the pressure on. All I can say is that I have never seen anything remotely like this. It has been exciting, scary, challenging, but most of all empowering. And things are only growing from here. Origin of #BlackLivesMatter movement. Check out the history of this phrase. Very interesting and instructive.